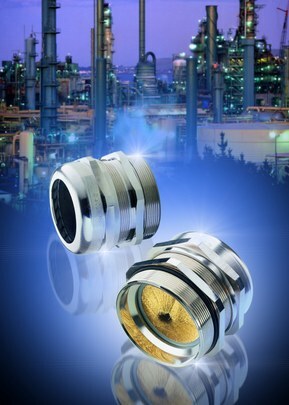 Leading cable solutions provider, Lapp Ltd, has developed a new version of its innovative Skintop® cable gland which offers a quick and reliable alternative to the traditional ‘spring’ contact method. The Skintop MS-M incorporates a unique brush connecting system for use with larger diameter cables such as those used in industrial applications including control cabinet construction, engine and tool building, conveyor systems and the automotive, paper and packaging industries. The Skintop MS-M Brush is specially designed for use with copper braid screen cable with external diameters of between 11 to 45mm and is available in metric threads from 32 to 63mm. Lapp’s brush system is EMC-safe and features thousands of brush strands in a circular arrangement which provide a wider and more variable clamping range and make assembly, disassembly and installation simpler and faster. According to Lapp, fitting the Skintop MS-M Brush cable gland could not be simpler and can be completed in a single operation. Installers simply enter the cable into the gland, slide the screening braid under the brush, turn to close and the cable is automatically centered, fixed, strain relieved and hermetically sealed up to protection class IP68. A further benefit of using a brush attachment system is that an optimal low resistance screen contact is achieved. In addition, it allows a high level of assembly flexibility, thereby allowing easy adjustment and rotation of the cable during installation. Click to see how to easily treminate the Skintop MS-M Brush onto a screened cable.